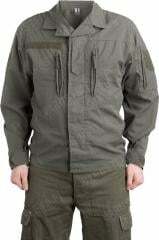 The current issue field blouse of the Bundesheer. A modern, neutral coloured field jacket for a decent price. Used. If you're looking for a good summer jacket that doesn't make you "pop", look no further. The current issue Austrian Anzug 03 field jacket is very simple: button closure, three zippered pockets and adjustable cuffs. Made of ripstop reinforced cotton or polycotton blend. Modern cut for ease of movement. The front closure has hidden buttons, one of the best options for field use: durable and easily fixed if necessary. First the easy size, then the user's recommended height and chest circumference. These run a tad large, so do not pick a larger size "just in case". In used but serviceable condition, and repaired when deemed necessary. Some of the zippers might have had some rough times though. Mukava, hengittävä kesätakki jossa riittää taskuja. Pitää myös vähän tuulta niin pärjää hiukan vilpoisemmalla kelillä. Napinreiät ovat alussa jäykät mutta väljentyvät käytössä. Silti tarvitaan kaksi kättä napittamiseen. Kaulan kohdalla saisi olla vielä yksi nappi. 3. Vedenpitävyys tuotteiden applikointi kankaaseen. Ainut huono puoli tässä takissa on se, että lihomisvaraa ei oo. Elintason noustessa kasvo kaljamaha takista ulos niin pahasti, että täytyy reuhottaa takki auki. Excellent piece of gear. Good fit, sturdy fabric that is comfortable but can take abuse. Was so pleased I bought a second one after re-stocking. In love with this jacket. Can't wait for the weather to get cooler so I can wear it. Tough stuff. Hieno takki ja todella mukava päällä. Good piece that is super well made and fairly well cut. Mine came in excellent shape with little signs of wear. If you need a shirt to kick through the brush when its warm and not care about it's future....this could be it! This is a great Summer jacket! very light, and breathable but traps enough warmth for the night. The pockets are stylish and hold a lot of stuff. The elastic straps in them keep stuff like your swiss army knife from bouncing around. Mine came in excellent condition, just needed a light wash. For $25 CAD it's a goddamn steal! Great shirt. it's a bit of a strange cut and has elastic through the back of the waist, but still very comfortable and sturdy. This is a nice light jacket that doesn't roast you in the hot weather. The cut is similar to the French Army's F2 field jacket, except this one is made of a lighter material and looks less boxy on the torso. I'm 167 cm tall with a 88 cm chest so Small Short fits me perfectly. The zippers were clearly used in my jacket--all the pullers are gone and the left pocket's zipper tap is broken at the tip. Sleeves are slightly baggy but not excessively so (the Anzug 75 and 03 heavy jackets are notorious for this)--it probably fits the balance between mobility and fashion fit, if that's your thing. 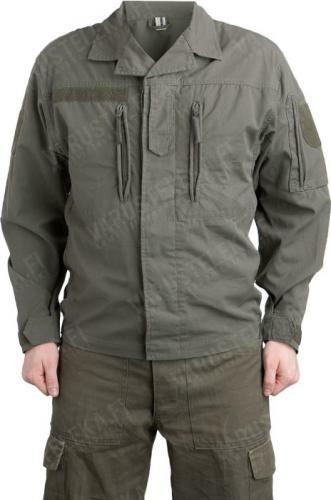 Some context: this jacket replaces the two service shirts (also sold on Varusteleka) as field and garrison wear. You can also do some layering with this thing in colder weather--I tried fitting a fleece underneath and it works fine! Hyvä takki, tämä päällä kehtaa liikkua kaupungilla, mutta toimii myös metsäisemmissä olosuhteissa. Tähän hintaan huippudiili. Koot ovat tosissaan aika reiluja, rinnanympärys itsellä n. 106 cm ja pituutta 186cm, ja "large long" on hieman väljähkö. Jos olet kahden koon välissä, ota pienempi. But BOY was it worth it! Its a darn practical, comfy, lightweight jacket. 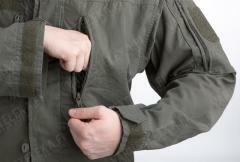 Three pockets, two chest ones and another one on the right upper arm (wichis the best invention since the invention of pockets), guarantee loads of storage capacity. These will keep your private documents save from burglars, women and your trusty Kameraden. Only needed to sew on one of the zippers. Ventilationholes at the armpits give you the ability to share the smell of an good workout with everybody that comes your way, while the adjustable sleevecuffs soak up the dripping sweat at your wrists. I would reccomend getting some spare buttons, just in case. Otherwise it is THE summerjacket to go for.